TheGunBlog.ca — The former chief of Canada’s No. 1 provincial police force negated a central narrative line of attack by the federal government, the mayor of the country’s largest city and others in their campaign against him and other hunters, farmers and sport shooters. 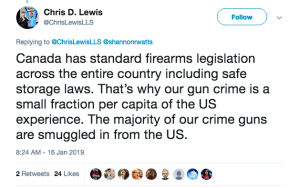 “The majority of our crime guns are smuggled in from the US,” Chris Lewis, the retired commissioner of the Ontario Provincial Police, said Jan. 16 on Twitter. The comment contradicts claims by Minister of Public Safety Ralph Goodale, his colleague Bill Blair, Toronto Mayor John Tory and others. They’re working to ban gun ownership or home firearm storage by Canada’s 2.2 million federally licensed shooters, including Lewis, by accusing them of supplying weapons to violent offenders and gangs. The prohibitionists have refused to present any evidence for their Domestically Sourced Crime Gun conspiracy. The evidence that is available, all of which has been obtained by Dennis Young, suggests their claims are false. Young is a former federal-police officer and parliamentary staffer who now publishes internal government and police memos and data. Lewis was tweeting a reply to Shannon Watts, a U.S. activist for civilian disarmament. The former police chief has previously challenged the claim that Canadian criminals get most of their guns from the domestic market.